South Jersey’s Virtua Health System plans to demolish an historic farmhouse and barn on the 110-acre Hogan Farm to build a new $1 billion medical campus, which will replace the nearby aging Mt. Holly hospital. Virtua purchased the Hogan Farm in 2014 for $10 million, and hospital representatives have stated in public hearings that they plan to demolish the historic structures on the property to make way for several medical buildings that will make up the new Virtua campus. 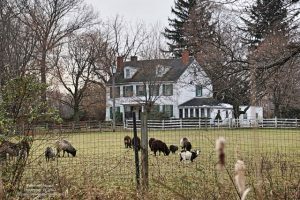 The farmhouse on the Hogan property was built around 1830, and according to a 1997 determination by the NJ State Historic Preservation Office, appears to be eligible for the National and State Registers of Historic Places. It provides “a well-preserved example of a 19th century agricultural complex with its complement of farm buildings, cultivated fields and pasture lands.” The farm house itself was judged eligible for the Registers because it is a “minimally altered representation of early 19th century vernacular architecture with late Georgian and Federal influences”. When the Hogan family sold the property to Virtua in 2014, the land had been in the family’s ownership for nearly 125 years. The Burlington County Farmland Preservation program attempted to purchase the property several years ago to permanently preserve it as valuable farmland, but the offer was turned down by the Hogan family. The farmhouse and barn are now vacant and not being maintained, and the farm fields have lain fallow for a couple of years while the hospital maneuvers through the permit process. The construction of the Virtua medical campus is not expected to be completed until 2022, a fact that does not bode well for the future condition of the vacant historic buildings. The prospect of such a large new healthcare facility in Westampton Township has garnered the support of the local officials who look forward to its positive economic impact on the town. Some local residents have expressed opposition to the project and are concerned about issues such as traffic and the impact of the development on the historic resources and associated historic viewshed, but it appears that this project will continue to move ahead. PNJ strongly urges Virtua to reconsider its stated plans to demolish the farmhouse and barn, and to find a way to appropriately incorporate these historic buildings into its plans for the medical campus. If that plan is not feasible, Westampton Township officials and local preservation advocates are encouraged to work with the hospital to find a way to move the farmhouse and barn to a nearby location for preservation – a less-desirable preservation solution, but one that will at least save them from the wrecking ball.